Flights to Fresh Creek, Andros from Fort Lauderdale are available on Watermakers Air and Air Flight Charters. Direct flights have many advantages. Nassau is the closest major hub to Andros. 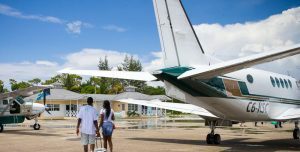 There are many airlines which fly into Nassau, but the main airline connecting to Andros is Le Air Charters. They’re a charter company, but also offer regular flights daily to Andros from Nassau. They are prompt, reliable, and professional. A final option is a charter out of Nassau: Glen Air Charters, they offer private charters directly to Andros Town. Whichever way you choose, you’ll fly into Fresh Creek, Andros, Bahamas, a quaint Airport with a friendly small-island feel. We will arrange for a taxi driver to be waiting to drive you to the Lodge. Transfers are $50/per trip and 2 passengers, $3.00 for any extra person. Of course, if you wish to do some exploring on your own you can rent a car, which are typically available for between $70-$85 per day. Typical drive is 15-20 minutes from Fresh Creek to Big Charlie’s Lodge. Nassau’s International Airport is divided into two sections: the Domestic Terminal and the International Terminal. They are located in different buildings, so you have to go outside the International terminal (where you’ll arrive) to make your connecting Domestic flight. When you leave you’ll do the opposite. Don’t worry, the airport staff are used to dealing with the confusion and most any baggage handler or security personal will be happy to point the way. Just remember, you must collect your baggage and clear Bahamas Customs in Nassau before you make your connection or your luggage won’t make it. For the more adventurous angler you might consider taking a trip over on Bahamas Fast Ferries. They provide a fun alternative to air travel between Nassau and Fresh Creek on Andros, and (depending on day/season) it can also be a savings. Departing from Potters Cay, Nassau, the ferry Sealink makes the trip to Andros in 2.5 hrs. Schedules are subject to change so be sure to confirm times with a Fast Ferries agent at (242) 323-2166 or visit their website. • All U.S. citizens MUST now have a valid, current passport for entry/reentry to the United States. • See the Official Bahamas website for a complete list of entry requirements for other nationalities. • Fly into Fresh Creek, Andros. This is the closest airport to Big Charlie & Fatiha’s Lodge. • Schedule arrival in Nassau as early as possible to avoid having to overnight there. • Save $15 for departure tax, unless it is already built into your ticket price. • Travel insurance recommended, particularly during the Hurricane Season. Carry-On vs. Checked Bags: Expensive tackle—rods, reels, etc—should be carry-on, but fly-lines are an occasional problem. 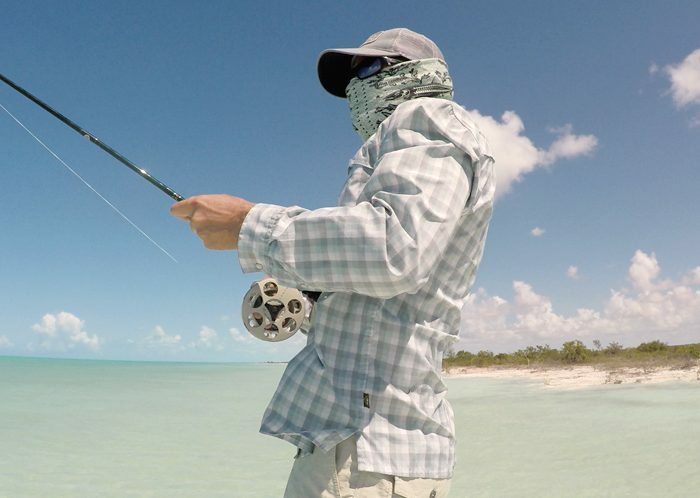 It’s been a while since we’ve had any issues, but there have been reports of anglers being asked to remove them when leaving the Bahamas. Within the US there’s no problem, but you should be prepared to check them if requested by security personnel. Simply removing the spools from your fly-reel can be a quick solution. Flies: The United States Transportation Safety Administration (TSA) actually recommends carrying expensive flies in your carry-on luggage. (See Article Here.) However, that may not be the case in other countries or leaving the Bahamas. If traveling from the US we recommend carrying on your flies and then checking them on the flight home.